India’s Sushma Swaraj pointed to the fact that Osama bin Laden had been living quietly in Pakistan before he was found and killed by a team of U.S. Navy SEALs, and said the mastermind of the 2008 attack in Mumbai in which 168 people died “still roams the streets of Pakistan with impunity.” Pakistan has said there is not enough evidence to arrest him. 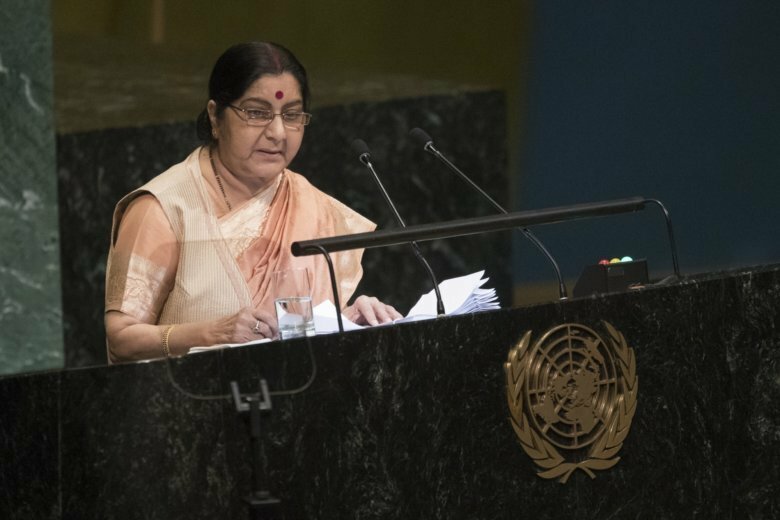 Swaraj and Pakistani Foreign Minister Shah Mahmood Qureshi were supposed to meet on the sidelines of the U.N. General Assembly this week. India called it off only one day after it was announced, following the killing of an Indian border guard in the disputed region of Kashmir. The two South Asian nations, always uneasy neighbors, face off under particularly tense conditions in that region at a “line of control” that cuts through a rugged mountain range. He welcomed the release of a report earlier this year by the U.N. High Commissioner for Human Rights that mentioned “chronic impunity for violations committed by security forces” in Kashmir. The report was written without visiting the region as both sides refused to grant unconditional access to the investigators. India at the time rejected it as a selective compilation of largely unverified information. The U.N. has had a peacekeeping mission in the region since 1949, making it one of the world body’s longest-running peacekeeping operations. It is currently one of the smallest, with about 120 troops as of last month.